Growing up, there were few things better than a snow day. Probably because they NEVER happened in Texas, and if they did, they were better categorized as ice days. Nonetheless, today was a snow day in Colorado. My kids absolutely love to play in the snow. 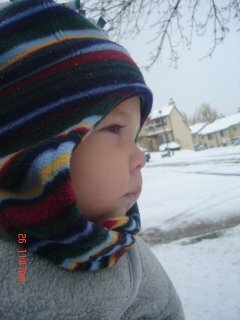 Even Jace was content to be in the cold with snow hitting his perfect little face. 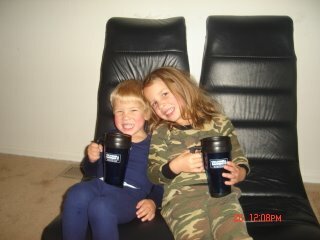 I love to see my kids having fun, and being snowed in also gave me the opportunity to clean my house! Thank you, Lord. We completed our snow time with hot chocolate and a Christmas movie. For Owen, "snow" and "Christmas" are synonymous. The only thing missing was Dad. He had to do something. I think it's called work! WOW! Absolutely Beautiful, the kids that is. Wish I could have been there and we all could have built a snowman!!! I love you guys. 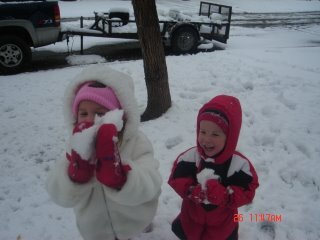 Snow is always fun....the first time around!!! I love the inside picture with the large hot chocolate mugs. I bet y'all had a blast!!! love the start of your blog too, Owen already looks soo big. Way to go v! I can't wait to get on board with this program! Precious family! Thanks for sharing your pictures & keeping me up-to-date on your fun life. Keep in touch! i love you babe. you are doing an awesome job with this. You guys are amazing. I could only hope to have as beautiful a family as you have some day. I love you all and miss you tremendously. Vel, I hope you keep this up. It's A W E S O M E!!! YOU KNOW I AM JUST PICKING ON YOU. I CAN'T BELIEVE HOW BIG YOUR BABY BOY HAS GOTTEN. HE IS A CHUBBY LITTLE THING--THAT'S CUTE!! awww the kids are so cute. Hi Velvet! I started my blog, great idea. I had fun setting my blog up there is not much to it yet. Tell your kids I said HI! !